With newspapers in the Middle East recording the lowest circulation growth rate in the past 3 years, a small but significant Arabic speaking audience is turning to the digital space to get their news fix, according to a study from the Arab Media Forum. Analysing news patterns in the region, with a specific focus on Saudi Arabia, Morocco, Egypt and the UAE revealed that while a majority of readers are still turning to print media, the regional political climate has led to a significant shift in news consumption. While migration from print to online has been slower in the Middle East in comparison to the rest of the world, all major newspapers in the region have a strong Web presence. 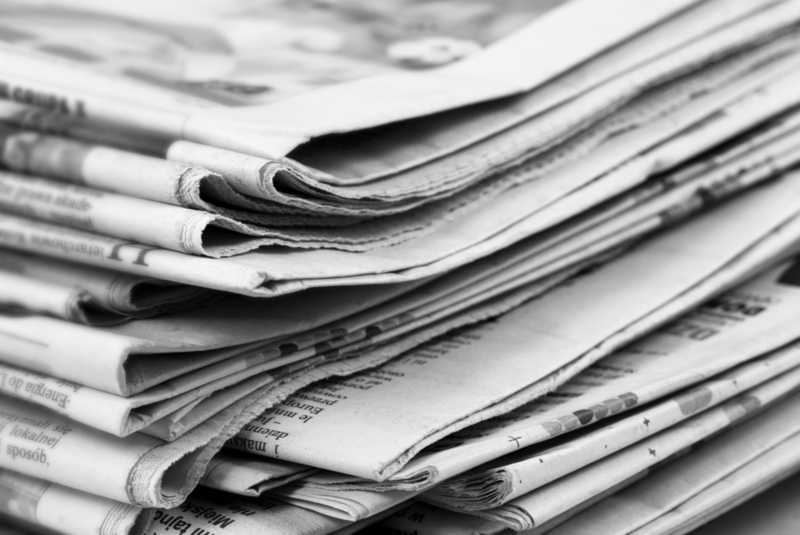 However, despite increasingly lower circulation rates, the majority of readers still turn to print newspapers as their primary source of information. 45.3% of respondents in the study read print newspapers only, 1% read online newspapers only, while 14.4% split their time between the two. 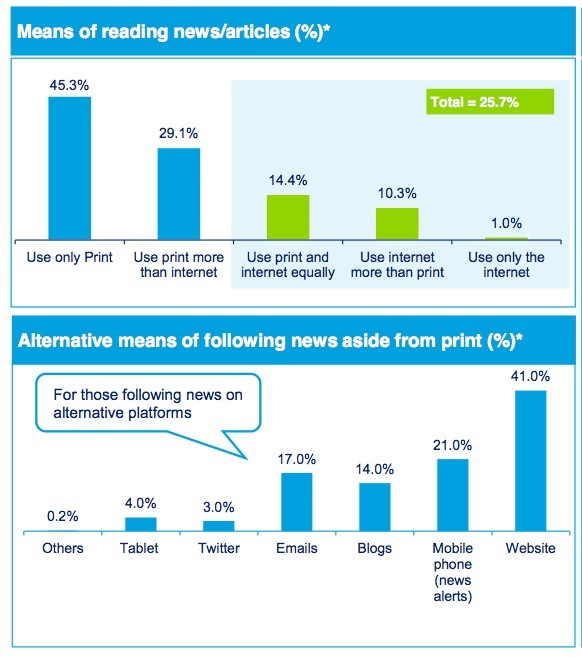 When it comes to alternate means of getting their news, while websites are the main source with 41% of readers going to websites, 21% are opting for mobile browsing, 17% opt for email, and 3% turn to Twitter. All of these figures should of course be cast in the light of Internet penetration rates in the region which are just over 35%. Case studies of specific newspapers in the region have shown that while some dailies might not have strong print circulation, they make up for it with their online presence. Egyptian newspaper Al Shorouk, for example, doesn’t make it in to the top 10 most circulated newspapers in the country, but is ranked third amongst online newspapers. In general, traditional media’s online properties are among the most popular, with either established local newspapers, whether independent or state-run, as well as pan-Arab networks such as Al Jazeera and Al Arabiya making it into the top 10 most visited news websites in each country. Facebook also appears in two of few of these lists, ranking third in Morocco and fifth in Saudi Arabia. One of the most surprising details to emerge in the study is that time spent online now exceeds watching television in certain age groups. In emerging markets, television tends to be a primary source of information, but of course it will be a long time before this trend becomes mainstream in the region. As far as monetization of their online content is concerned, Middle East publishers have only benefited from one revenue stream – digital advertising. 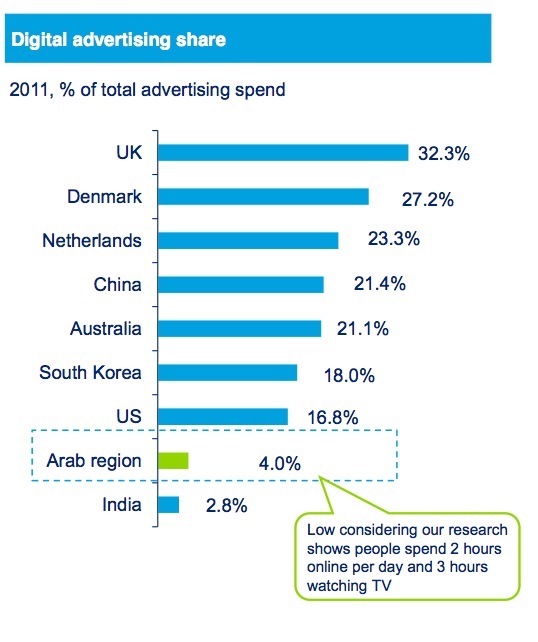 Digital advertising spend in the Middle East makes up a low 4% of the total. In comparison, the UK spends over 32% of its advertising budget on digital, China sits at 21.4% and the US at 16.8%. The study predicts that digital advertising spend will reach 10% in the Middle East by the end of 2015. Conversely, print advertising spend has been in a constant decline for the past 5 years.